The Java plugin refuses to run unsigned applets, starting with version 1.7u51. 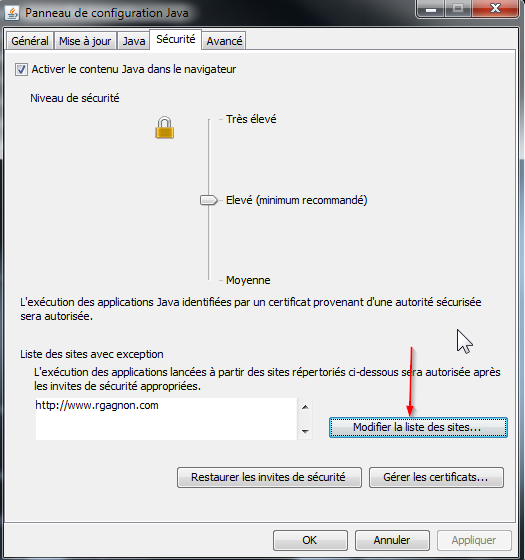 It shows the message "Application blocked by security settings", and no visible option to override this limitation. To allow unsigned applets, you need to create a whitelist. If the unsigned applet is coming from one the websites specified in the whitelist then its execution will be permitted. The whitelist is simple text file called exception.sites containing one URL per line. This file must be located in the user's profile which is %APPDATA%\Sun\Java\Deployment\security for XP, and %USERPROFILE%\AppData\LocalLow\Sun\Java\Deployment\security for Win7. So if you are on Win7, create the text file exception.sites with the required line for rgagnon.com as mentioned above. Save the file in the directory C:\Users\*YOUR USERNAME*\AppData\LocalLow\Sun\Java\Deployment\security. Go to this page to do a test with an unsigned applet. You will still have one security popup to click before running the applet. The Java Control Panel is not in the Control Panel of Windows any more, instead it is now in the Start Menu as "Configure Java" (java). Go to the security tab, click on the "Manage Site List"
Click on "add" for each site you want to add to exception list. The above procedure can be cumbersome, especially in the enterprise environment since it is specific for one user. It is easier to have one global whitelist and make sure that every users are using it. You declare the common location of the exception list in "Deployment Properties" file located in %windir%\Sun\Java\Deployment\deployment.properties. If this .properties file doesn't exist then you need to create it. You add one property called deployment.user.security.exception.sites, you specify the complete path to the shared exception.sites file. Make sure to use "/" or "\\" as directory separator. This location can be on a network share if needed. An interesting page on the subject with some possible issues for Firefox or Chrome.